A wonder in itself, an idol with such a magnificence, grace and purity. 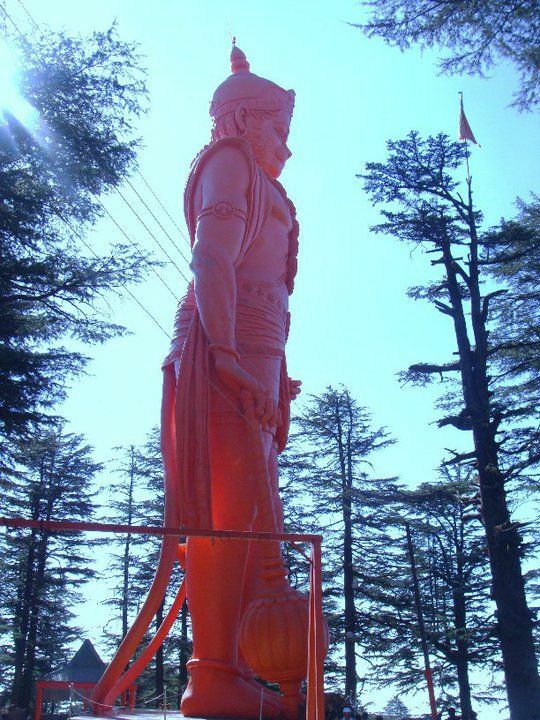 I am talking about none other than, a newly created wonder of the world: The Tallest Idol of Lord Hanuman Ji, at the highest ever altitude of 8000 feet (2455 mtrs) above the sea level. Jakhoo Hill is the highest hill of Shimla city. This idol of Lord Hanuman Ji is 108 feet in height. With the erection of this statue, Jakhoo Temple, already world famous for its sacredness and sanctity, has added a priceless gem to its name. The installation of this idol has created a new World record of being the tallest statue ever erected at such a high altitude. With the blessings of Lord Hanuman Ji, the foundation stone for this idol was laid on 27th October 2008, on the occassion Hanuman Jayanti by Prof. Prem Kumar Dhumal, Hon'ble Chief Minister of Himachal Pradesh. Within a short stipulated span of 2 years, this magnificient structure was created. And now, it is before us, unveiled on 4th November 2010 by Prof. Dhumal, in the presence of Mr. Abhishek Bachchan, Actor and Mr. H. C. Nanda, Founder of Nanda Trust, the most lucky and privilaged Trust to have undertaken this mammoth task by funding this multi-crore project in the name of the almighty. I don't find anybody as lucky and privilaged as Mr. Nanda, because Lord Hanuman ji gave him this precious opportunity to have constructed this idol, which is visible from as far as 7 kilometres in the dia of Jakhoo Temple. During war against Ravan, when Lord Lakshman (younger brother of Lord Ram) fell unconscious due to the supernatural effects of a vaana (arrow) aimed by Megnad (son of Ravan), then to bring him back to life, Lord Hanuman went to the Himalayas to fetch the Sanjivani booti (life giving herb). On his way, he rested for a bit at the Jakhoo Hill, where Rishi Yaako was performing spiritual meditation (tapasya). The divine and sacred footsteps of Lord Hanuman Ji are still kept safe in the Temple complex. The divine self generated idol (Saakshaat murti) of Lord Hanuman Ji enhances the glory and sanctity of the Sanctum Sanctorium (Gabh Griha) of the Jakhoo Temple. It is a authentic and experienced belief that whosoever comes to this temple, with strong faith in the core of his heart, gets whatever he desires for. May Lord Hanuman Ji fulfil all your dreams and meaningful desires. And please make it a point to visit this temple and view this magnificient piece of sculpture art if you haven't done it yet. 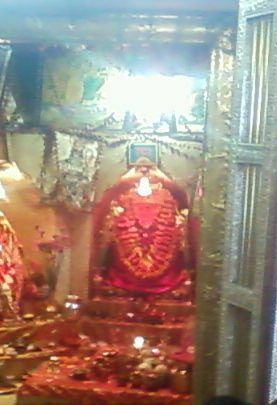 Jai Hanuma. I think "HANUMAN JI" is most powerful god in universe. I pray to "HANUMAN JI" for long and happy life of every good person in world. Reading hanuman chalisa will give you Success. Jakhu temple is one of the popular temple of Shimla that provide a beautiful time spending with the nature and environment. I also visited Shimla from Jammu to make my weekend in a different way. The place is very suitable for each and every tourist.